People in the duchies of Modena and Reggio have always tried to add something more to the ancient vinegar, which has always been produced in the world, first with different ingredients, some other times with the addition of flavorings in order to make its taste less pungent. This tradition was kept first as a simple familiar tradition for a very long time and then gained more and more fame since the 19th century, ending up receiving the official reputation of “Balsamic Vinegar of Modena” in 1933. It still endures in modern times and makes the area of Modena peculiar, with a seasoning able to exalt a surprisingly vast variety of food and with an intense and intriguing scent. Nowadays, Rustichella d’Abruzzo introduces it in its four essences: Gold, Silver, Copper and White Dressing. 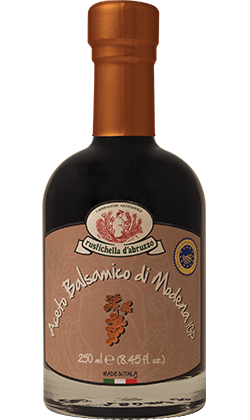 Balsamic Vinegar of Modena - GOLD, suitable for game, fish, cheese, strawberries, ice cream and can be a good digestive. 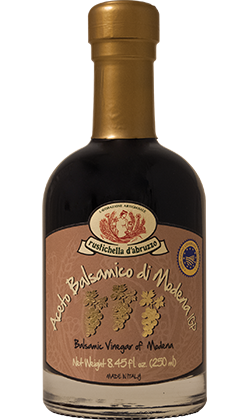 Balsamic Vinegar of Modena - SILVER, to enrich dips, eggs, steamed vegetables and cheeses. 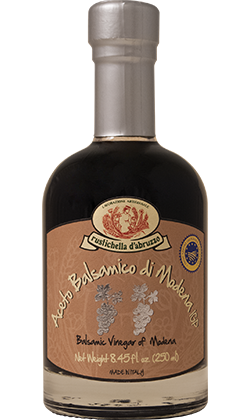 Balsamic Vinegar of Modena - COPPER, Great for everyday use on salads, cooked and raw vegetables, grilled and roasted. 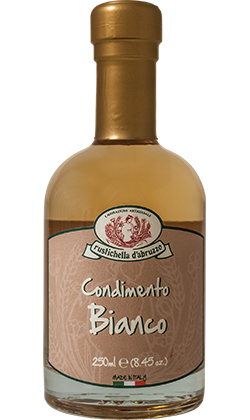 Balsamic Condiment WHITE, Light and delicate, indicated especially in the summer season. It is indicated with grilled vegetables, fragrant on raw vegetables, and with fish. All the taste of a lively and always harmonious seasoning, full of Italian tradition and ready to be appreciated. The balsamic vinegar of Modena is obtained by a machining process of cooked must, concentrated must, wine vinegar. The must used for the production comes from grapes grown exclusively in the province of Modena. Already known in the Roman times and always linked to the culture and history of Modena, the Balsamic Vinegar of Modena is one of the ambassadors of Italian wine and food excellence in the world. In 2009, the Balsamic Vinegar of Modena was registered as PGI by the European Union. The balsamic vinegar of Modena "COPPER" stands out for its versatility in the kitchen and is recommended to enrich and flavor the fresh salads of the season and all those simple recipes of daily preparation. The balsamic vinegar of Modena is obtained by a machining process of cooked must, concentrated must, wine vinegar. The must used for the production comes from grapes grown exclusively in the province of Modena. Already known in the Roman times and always linked to the culture and history of Modena, the Balsamic Vinegar of Modena is one of the ambassadors of Italian wine and food excellence in the world. In 2009, the Balsamic Vinegar of Modena was registered as PGI by the European Union. The balsamic vinegar of Modena "SILVER" stands out for its medium density and intense and fruity aromas. Recommended for a cool dip for vegetables or for the preparation of the game it will be an indispensable companion to be used with confidence even to accompany ice cream with strawberries. The balsamic vinegar of Modena is obtained by a machining process of cooked must, concentrated must, wine vinegar. The must used for the production comes from grapes grown exclusively in the province of Modena. Already known in the Roman times and always linked to the culture and history of Modena, the Balsamic Vinegar of Modena is one of the ambassadors of Italian wine and food excellence in the world. In 2009, the Balsamic Vinegar of Modena was registered as PGI by the European Union.. The balsamic vinegar of Modena "GOLD" stands out for its extraordinary density, the delicate, persistent scent with pleasant and harmonious acidity, for the deep brown colour, for acetic smell with woody overtones and for the balanced, sweet and sour taste. Particularly suitable for the game, the fish, the cheese, strawberries, ice cream and can even be used as a digestive. It is a young vinegar, produced from grape must that has undergone indirect heat concentration. The sugars present in the grape must undergo an alcoholic fermentation, which will be interrupted by the addition of must already in the process of acidification. The product, aged for several years in different wooden barrels (oak, chestnut, ash, etc.) will take valuable organoleptic characteristics that confer flavour and special perfumes.